208 Benson Circle, Mill Valley — Tucked away in the Mill Valley Meadows enclave of Scott Valley, this beautiful 6 BR / 4.5 BA (including a 1 BR/1BA legal separate unit/in-law) secluded family estate is surrounded by open space on all sides. This spectacular custom-built home boasts grandly proportioned spaces, an open-floor plan and bucolic views of Mt. Tam and the surrounding natural landscape from almost every room. Encompassing approximately 5,900 sq ft (buyer to verify), the home feels a world apart though it’s just minutes from Hwy 101 and downtown Mill Valley and 11 miles from San Francisco. Guests entering 208 Benson Circle through the custom leaded-glass front doors are greeted by an enormous two-story foyer with a grand staircase to the upper level, and an expansive living room to the left. French doors in the living room open out to an entertaining patio and level lawn area creating an ideal indoor/outdoor flow. The light-filled living room features hardwood floors, a wood burning fireplace, custom-built cabinetry and vaulted ceilings. There is also a large built-in window seat perfect for relaxing or reading a book while looking out at the gardens. “A perfect family home with a great floorplan and an ideal setting. A formal dining room just off the living room opens out to an inviting wraparound outdoor dining / sun deck with a passthrough window to the kitchen for easy outdoor entertaining. Adjoining the sundeck is a cozy, enclosed sunroom off the kitchen / family room, perfect for gathering with friends on chillier evenings. There are multiple dining and lounging options regardless of the weather! The open-concept eat-in kitchen boasts stainless appliances, quartz countertops, a modern tile backsplash and a center island with a butcher block top ideal for casual gatherings and dining. The kitchen is open to the large family room with custom cabinetry / shelving, a bay window that looks out onto the Mt. 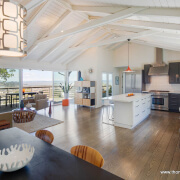 Tamalpais views and plenty of space for family and friends to watch movies or socialize. The main floor of the home is truly an entertainer’s delight. The large master suite is located upstairs and features French doors that open out to a deck with stunning views of Mt. Tamalpais. A sitting room / office adjoins the master suite, providing a quiet, secluded area away from the rest of the house. The master closet must be seen to be believed – it is enormous with an abundance of floor-to-ceiling custom cabinetry and shelving. The master bathroom is adjacent to the closet, and features custom stained glass windows, a soaking tub and a large separate shower. There are 3 other spacious bedrooms upstairs including a secondary master with an ensuite bath and sitting room and 2 other large bedrooms connected by a “Jack and Jill” bath. Located below the lower level is a large multi-purpose room, suitable for a well-outfitted home gymnasium or children’s playroom. It features plenty of windows and lots of light, looking out onto the view of the surrounding property and Mt. Tamalpais. There is also interior access into the 1 BD/ 1 BA apartment from this space. The legal unit is also situated on the lower level and features an interior entrance from the multipurpose room as well as an exterior entrance. At approximately 900 sq ft, this space includes a full kitchen, living area, bedroom and bathroom. There is also a private deck off of the exterior entry. Ideal as an income generating legal rental or as a separate, private living situation for family, guests or an au pair. Scott Valley is one of Mill Valley’s most prized neighborhoods, valued for its proximity to Edna Maguire Elementary School, The Scott Valley Swimming and Tennis Club (see below) and the Mill Valley / Sausalito Pathway. Scott Valley is bounded by East Blithedale and Camino Alto and provides convenient access to 101 as well as downtown Mill Valley to the south, and Corte Madera / Larkspur to the north. A family-oriented community, Scott Valley is anchored by one of southern Marin’s best athletic facilities. Scott Valley Swimming and Tennis Club, which provides a variety of activities for its members. Tennis clinics, swim lessons and a complete fitness facility can be found at the club. Many of the HOA neighbors belong to the Swimming and Tennis Club but the club is not owned or operated by the HOA. Mill Valley Meadows is a community of 39 families, encompassing 69 acres of private and HOA-owned open space. It is surrounded by Marin Municipal Water District open space land and Horse Hill grazing land, part of which is owned by the HOA and leased to the Alto Horse Owners Association for grazing purposes. From Mill Valley Meadows there is direct access to miles of hiking, equestrian, and biking trails. Situated just a few minutes north of the Golden Gate Bridge, Mill Valley is nestled below majestic Mt. Tamalpais and is reminiscent of a picturesque European village with its charming downtown center and natural beauty. Surrounded by national parks, including Muir Woods, Mill Valley’s lush landscape of hills and canyons are a favorite place for residents and visitors who enjoy hiking, mountain biking, walking and running. Mill Valley functions as a self-contained “village,” with many shopping and dining options ensuring residents do not need to leave town unless so inclined. 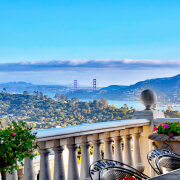 Please call Thomas at 415-847-5584 to be one of the first to see this exquisite property. Second Kids' Bedroom Sink Area With View!